You would think with nine lives, cats would be a little bit more adventurous and open to traveling. But no, cats loathe traveling. If anything, they would rather skip the whole experience altogether. So here you are, presented with an opportunity to hit the road and you want to bring your cat along. What do you do? Stick him in the back seat and get going? Absolutely not! In fact, far from it. Unfortunately, cats are not like dogs; you can't just put them in the car, roll a window down and tell them to behave. Before you know it, he will be on the roof of the car or on the dashboard or even curled between your legs. All things which you don't need while driving. These little creatures are spooked by traveling and would rather stay in a familiar environment (home). However, we’ve all seen it happen before, cats riding comfortably in cars with their owners. Meaning it can be done. It will take a bit of time and patience, but this is how to prepare your cat for car travel. Enjoy! The first and most important rule of traveling with your pet is to keep them in a carrier. This especially applies to cats which are small and quite curious. Even if your cat is well behaved, letting him loose in the car poses a threat to the both of you. He might hop on the dashboard or go under your feet while driving, increasing your chances of causing an accident. You most certainly don’t want him out in the open if he is all spooked about traveling. The hard part is getting your cat to accept going into their carrier. Once this is out of the way, you guys are halfway there. We touch on this in a bit. First, what type of carrier should you get your cat? There are several pet carriers out there, the main difference is usually the material it comes made in. In this case, you’ve got fabric, plastic and metal carriers. I’m not a big fan of metallic pet carriers because of their cage-like feel and most of them don’t meet airline regulations so you may have a hard time air traveling. The main features to look out for when going for a cat carrier are space, ventilation, ease of carrying and comfort. We put together a great cat carrier buying guide on this very subject if you need a recommendation. If you happen to have two cats, it’s obvious that your cage should be big enough to fit them both in. Most importantly, make sure they get along well to avoid interruption while on the road. In case they don't, separate cages are much easier and time-saving than trying to quash cat squabbles. If you prefer, you can also choose to utilize a cat backpack for safely transporting your cat. You will often find that many cat backpacks available for purchase provide you with the ability to use your car's seatbelts to secure the backpack in place. The first time I had to put my cat in a carrier totally spooked me out. Not because of the resistance she put up but because some carriers look sad and cage-like. It's like sending your little fur ball to cat prison for a few hours. If it’s not fun for you to get kitty in the carrier, imagine how bummed your cat must feel. To make this process move along smoothly and much faster, try to patiently introduce your cat to the carrier. Start small like putting her food in the carrier every now and then. When she is okay with this, move the carrier to a different room and repeat. You can work with other things other than food, for instance, toys. With time, the carrier will have its scent, making the process a whole lot easier. Getting in the carrier is one thing but being able to ride in your car is a whole new hell for your cat. For him to finally get used to the idea of long car rides, you will have to start small. Take a small test drive around your block with your cat in the carrier. Do this as often as possible with every ride a little longer than the last. In case it’s his first time in a car, expect a little resistance. A quick fix for this is to get the cat’s scent in the car. You can do this using food and toys. Leaving your cat’s beddings in the car for a while will also work. The first rule after putting your cat in the carrier is to secure the carrier with a safety belt. Why? For the same reason, you are wearing one; safety! The last thing you want is to pump the brakes and send your cat flying out of the car! No loud music in the car. If you like to crank up your radio when traveling, be ready to tone things down when kitty is around. Cats hate noisy environments as they tend to spook them out. It is bad enough he is on a road trip, you don’t have to make it hell by turning up the music. Pull over every few hours for the both of you to stretch out. Even though your cat is in a well-spaced carrier (large enough to stand and lay down comfortably), frequent stopovers are a must. This is especially if your journey takes more than 12 hours. Let him out of the carrier for a quick stretch before hitting the road again. Never leave your cat harness behind. Since you will be letting the cat out of the carrier every couple of hours for a stretch, make sure you have him well secured. A cat harness and leash ensures your cat does not run loose in the car during travel breaks and makes it easier for you to get a hold of him in case he does. Never put the carrier at the back of a pickup truck. I know it sounds ridiculous and obvious but, so many people make this mistake with their pets. This poses all kinds of danger to your pet and should be avoided by all means. Always have your cat riding in the passenger seat or back seat. Never the boot or back of a pickup. A little cat chat is highly encouraged to prevent your cat from getting bored. While traveling, also remember to feed your cat as well as giving him some water. Oh, and don’t forget to open a window for fresh air but remember to close it when you let her out of the cage, especially if she is a naughty cat. These are symptoms of exposing your cat to traveling in cars, planes and even boats. The same way we may get anxious on our first boat or plane ride, cats may experience the same. The best way to solve these problems is by frequent test drives which eventually calm your cat down with time. Alternatively, there is a quicker but controversial solution to this; medication. You can ask your vet to prescribe some sedatives for the hyperactivity and anti-motion sickness meds ahead of the traveling day. It doesn't sound so pleasant but in many cases, these pills when prescribed by a vet are harmless. Make sure you ask your vet all sorts of questions on medication before giving them to your cat. The goal here is to travel safely to your destination, not to change your cat’s mood for life. The amount of stuff you pack for your cat depends on how long you plan on staying on the road. However, essentials such food, drinking water, toys and a harness are an all time must have. Carrier lining will help your cat stay comfortable throughout the journey, hence causing no fuss. Depending on how often your cat uses the litter box, you can decide whether to bring it with you or leave it at home. Cleaning supplies are another must-have in case of slip-ups such as your cat vomiting. 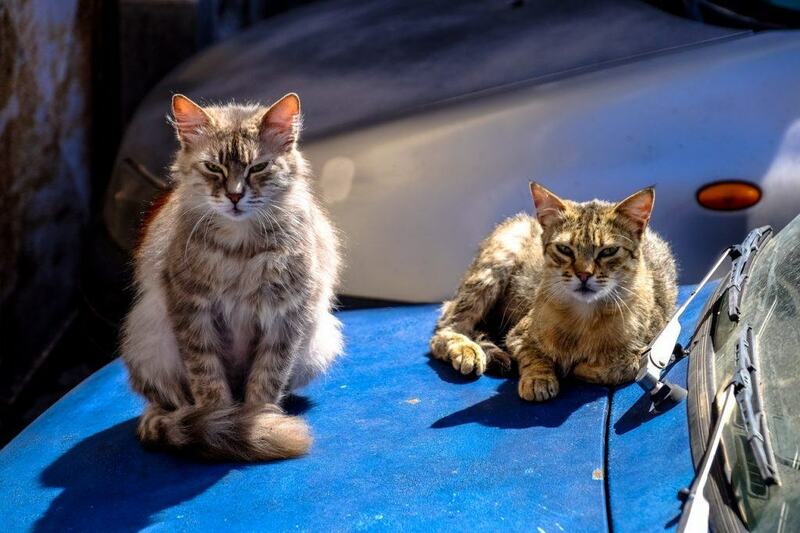 You can always buy already filled litter boxes for your cat on the road as well as disposable waste bags which you can be emptying at each stop. This will prevent your car from smelling like, well, cats! Remember, it's your car, not his! ​I know I have said this so many times but one more time wouldn't hurt. Keep your cat in a carrier! It keeps you focus on the road and not on your cat and most importantly, keeps both of you safe. Lastly; it is better to have and not need than to need and not have. So, if you think you'll need it on the journey, pack it up!